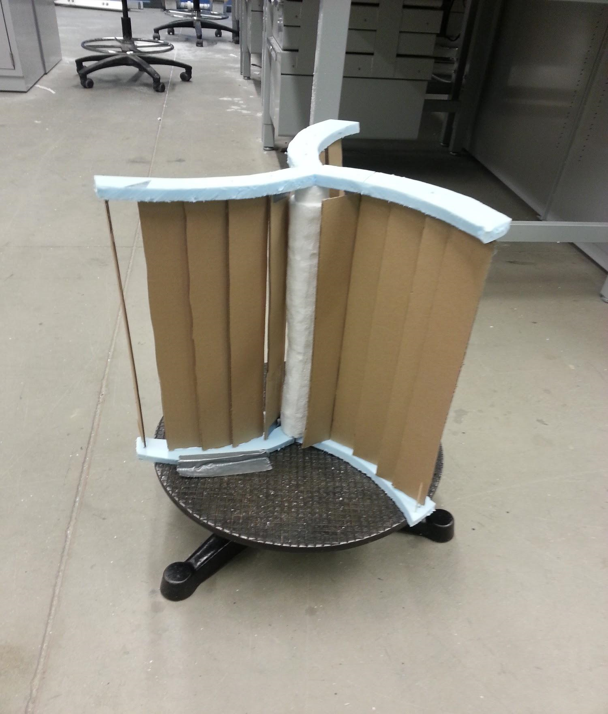 For my senior design project, a team of seven engineers were tasked to design and construct a lightweight, transportable wind turbine that can be used to power small electronic devices, for the Collegiate Wind Competition by the US Department of Energy. The project was divided up into four main subsystems-- blades, shaft housing, generator/electronics, and support systems. The work documented below is focused around my work on the blades design for this vertical wind turbine. The competition included three elements. In addition to a technical engineering evaluation of the design and its performance, each team developed a business plan specific to the product and its proposed market. Finally, each team demonstrated through an oral presentation, an understanding of substantial social, political and technical issues concerning the development of wind power in our region. 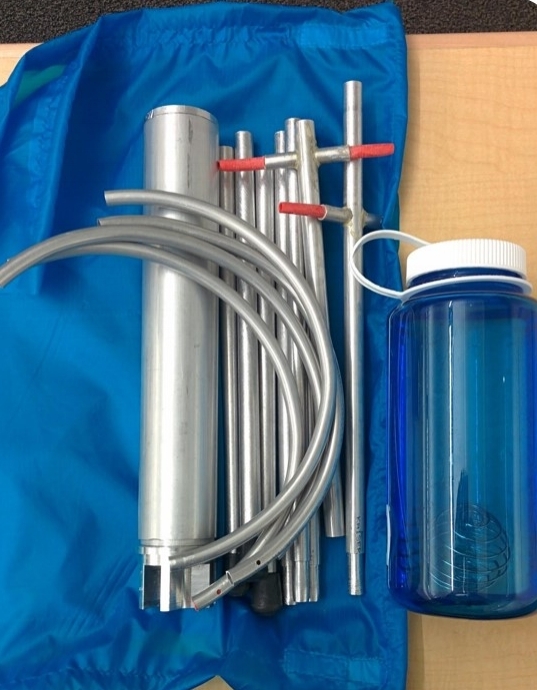 The team aligned with the aim to provide a financially competitive, portable green energy source that would give hikers and campers access to environmentally friendly power in situations where access to power is limited. 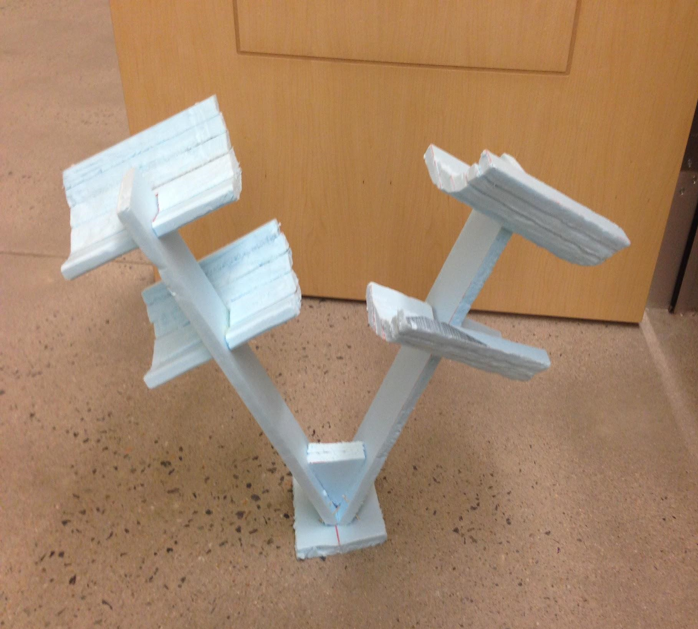 After market research, the team chose to build a vertical axis wind turbine for its low cut-in speed. 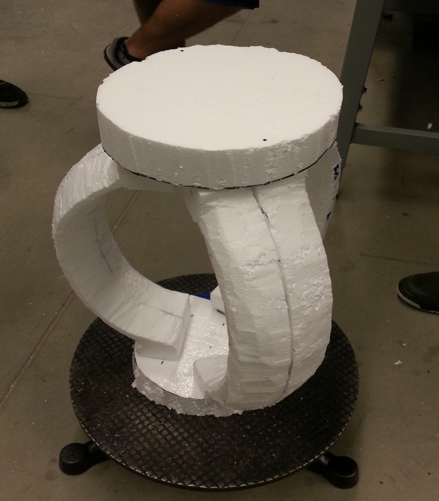 Before the final design of the Revolve was reached, there were several stages of modeling and testing performed. Below is an outline of several design concepts and the corresponding prototypes. The Darrieus is a vertical wind turbine that works on a principle of lift. 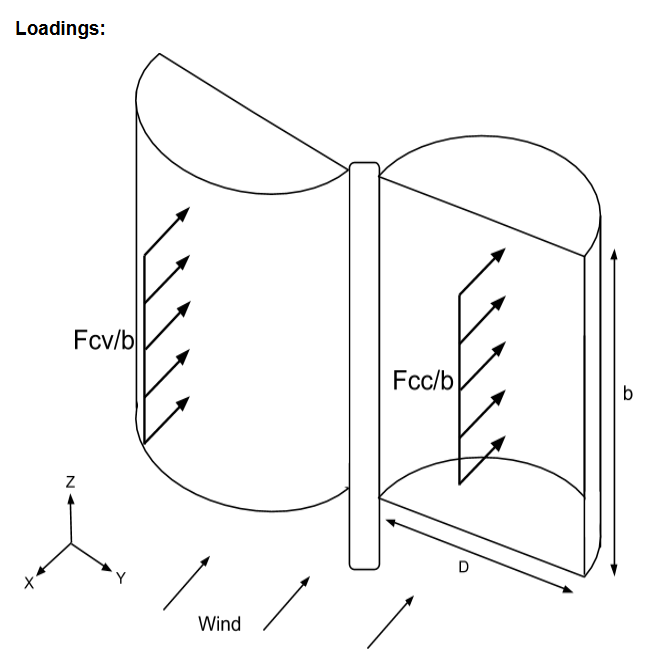 Airfoils attached to the central axis such that as the wind blows each blade generates a lift force which is converted into rotation. 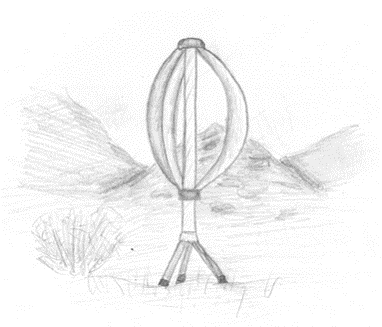 This unique design eliminates a problem found with many vertical wind turbines. The Slatted Savonius separates each blade into a series of slats that rotate the blades parallel to the wind during the non-power stroke part of the cycle. The Split-Axis Vee operates on both principles of lift and drag. However, due to the "V" design, it creates a large amount of vibration, with a high cut-in speed. The blade team tested the slatted Savonius blade design in the wind tunnel on campus to collect data and compare it to theoretical performance curves. 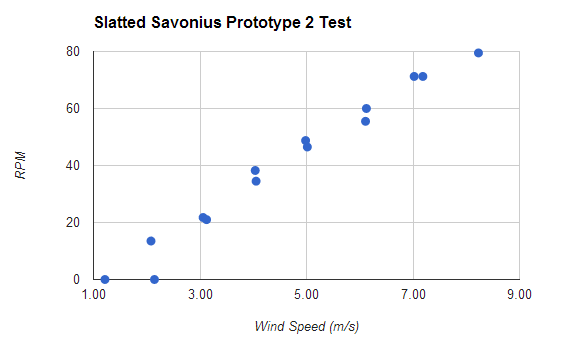 The results showed encouraging results that the Slatted Savonius rotated at 80 rpm at a wind speed of 8 m/s. But during the testing process, we discovered many unforeseen problems. While generating the most power this design was wasfound to violently swing back and forth, causing a loud clicking noise. We discovered that a single steel ball bearing did not sufficiently support the central shaft and the heavy acrylic slats introduced a rotational imbalance due to the sudden change in angular momentum when the slats rotated. The gearbox also had a ratio too small to produce sufficient voltage. The team concluded that multiple bearings, lighter blades, and a higher gearbox ratio were necessary to improve performance. Incorporating the results from the wind tunnel testing, the fabric Window Savonius was developed. This design maintains the same key design feature of the Slatted Savonius, opening and closing blade components, but reduces weight and therefore imbalanced. It was initially thought that three blades would provide better overall balance, but after re-evaluation, it was determined that two would be more appropriate and the reduction in weight and manufacturing complexity was an added advantage. Designed to break the societal idea of what a wind turbine should look like, the Revolve is perfect for individuals spending significant amounts of time outdoors or away from the grid. Priced at $175 Revolve is ideal for small power generation and can operate at low heights where wind speed is minimal. The two blades of the Revolve are made out of nylon ripstop fabric “windows” that open and close to reduce destructive drag, a significant drawback of a standard Savonius, increasing its efficiency. The Revolve’s collapsibility feature will allow it to have minimal size impact, a characteristic that is vital to backpackers and campers. For the competition we delivered a presentation about "How To Modify the Appearance of Wind Farms to Make Them More Culturally Accepted." Wind energy is renewable, clean, and abundant. Yet when you try to build a wind farm immense opposition always come out. There is a gap between the positive perceptions of 'wind power' and negative connotations of 'wind farms'. In the presentation we discussed the NIMBY’s, or Not-In-My-Back-Yard people and potential solutions to overcome these perceptions.